Kitzur Likutei Moharan, "filled with ethics, fear of G-d, good, correct, wonderful and awesome practices, which emerge from the remarkable essays printed in Likutei Moharan", from the teachings of R. Nachman of Breslov, edited by his disciple R. Natan Sternhartz – Moharnat of Breslov. 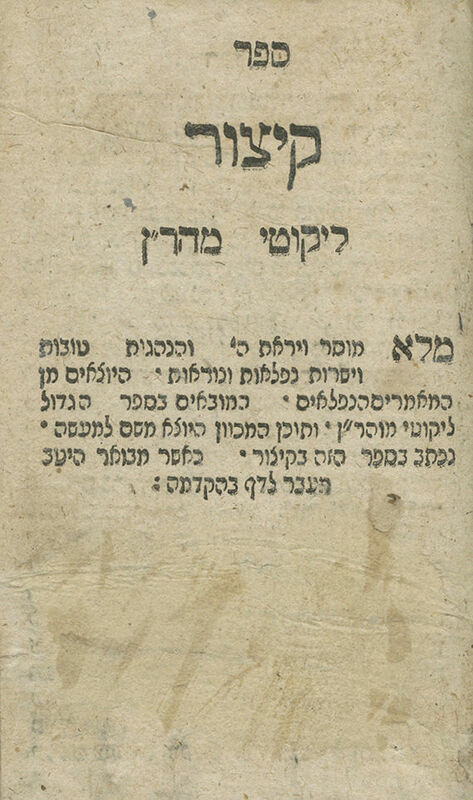 [Breslov (Bratslav): printed in the home of R. Natan, 1821]. Second edition. This book contains selections of practical topics related to worship of G-d, which R. Natan compiled from the book of his illustrious teacher - Likutei Moharan. The entries in this book follow the order of their appearance in Likutei Moharan (rather than in alphabetical order, as in Likutei Etzot). This book was published after the passing of R. Nachman, but R. Natan began writing it already in R. Nachman's lifetime, in 1805. R. Natan relates this in his preface to the book: "Most of the words of this volume were presented before Rabbenu and he found them satisfactory". In his book Yemei Moharnat, he goes into more detail: "In 1805… he commanded me to select from his teachings the advice and lesson which one can retain from each one of them… and he was pleased with it, and that is the book Kitzur Likutei Moharan. When he read it, he shook his head and said: A fine note, and I understood that the teachings written there were very much to his satisfaction, and he truly longed for us to fulfill them. Fortunate is the one who keeps to them" (Jerusalem edition 1982, p. 12, section 7). The first edition of the book was printed by R. Natan in Mohilev (Mohyliv-Podilskyi) in the summer 1811, during the year of mourning following the passing of his teacher. This edition was published a decade later, in the printing press which R. Natan established in his home in Breslov (R. Natan set it up in 1819, and it was shut down in 1824 after someone reported it to the authorities). In this edition, several lines were added to the preface in parentheses. 87 leaves. 13 cm. Fair-good condition. Stains and wear. Dampstains to some leaves. Worming and tears to title page and other leaves, affecting text, repaired with paper (approx. 10 first leaves, a few leaves in middle and end of book were professionally restored). New binding. Place and year of printing according to: G. Scholem, Eleh Shemot Sifrei Moharan, Jerusalem 1928, p. 33; A. Yaari, Likutim Bibliographim – Kiryat Sefer, vol. XIII, 1936-1937, p. 532.